In 1976, the country was celebrating the bi-centennial of its founding. Robbins Hunter, a passionate Licking County historian, and the namesake of today’s Granville museum, felt strongly that something was missing in this national celebration, a monument to Victoria Woodhull. Woodhull, you see, had carved out a place in history, but few knew much about the Licking County native or what she had accomplished in a time when women’s activism went largely unacknowledged. Hunter knew, and according to Director Ann Lowder, made it his project to build a memorial to Woodhull in the garden, complete with a statue likeness of her that made an entrance from a clock tower on the hour as bells rang. Perhaps it was the 2016 election where the country might have witnessed its first woman president. Perhaps it’s the passion of volunteers who admire Woodhull and think it’s time for her to be better understood and recognized for her achievements, notable today, and utterly unimaginable for the Victorian times in which she lived. Whatever the impetus, the museum is taking Hunter’s lead. Thanks to the efforts of board members Judith Dann and Christina Gray, and former board member and Denison University Gender Studies Dept. chair, Gill Miller, along with a planning grant from the Ohio Humanities Council and the partnership of Denison, RHM begins a multi-year project that will focus on the multi-dimensionality of Woodhull’s legacy. 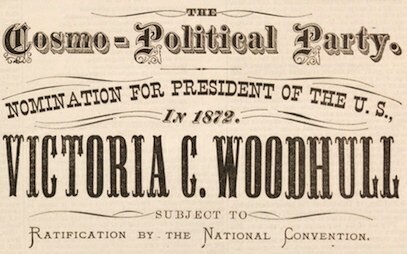 In a series of round-table discussions over three years beginning in 2018, each session highlights one of the many areas of interest that Victoria Woodhull advocated in her life. The Victoria Claflin Woodhull: Phoenix Rising series begins on February 8 with a roundtable titled Courageous Voices, an introduction to Woodhull and her historical context as well as to the organization and rise of social reform in the 19th century. The second roundtable is set for April 19. Scandalous Voices, Journalistic Truths, Standing in the Face of False Rhetoric, is a discussion of women in the media, journalistic truth and “fake news.” And finally, on September 14, the roundtable Dangerous Voices, Women Who Speak the Truth, brings the first year of Victoria Claflin Woodhull: Phoenix Rising to a close. More details on location and how to register will be forthcoming. “It is our goal to foster, through these roundtables, an educated, thoughtful discussion of her life and ideas as well as create a website of vetted primary sources and scholarship that would be a resource for those interested in studying her,” said Dann. Dann, Professor and Classics Lead in the Humanities Department at Columbus State Community College, lives in Homer, Ohio, Woodhull’s birthplace, and has taken both a personal and academic interest in Woodhull. “I have been researching her life for nearly 20 years and giving lectures around Ohio about her. Also as a board member of the Homer Library, I advocate for her memory there,” she said. “Scholars and professionals from across the nation are expected to participate in the roundtables in order to exchange ideas and speak on the identified themes from their discipline’s perspective. These will become the platform for discussion on how these issues might inform intellectual pursuits and policy making in our own time,” she added. Supporting the partnership is English professor Liz Weiser of Ohio State University in Newark. Weiser, who acted as project evaluator for the Ohio Humanities Council, offered the services of an intern from her department to assist the project. Senior Kyle Smith, who is interested in 19th century feminism and women’s rights, will work alongside the committee. “It’s a natural fit,” Gray said. Thus through combined efforts, Victoria rises again at Robbins Hunter Museum. The original figure of Woodhull disintegrated, the delicate works of the clock sold off, and the shambles of a balcony hanging precariously are now all repaired or replaced. Computer chips perform the clock mechanics, a new statue of Victoria makes her entrance on the hour again thanks to local carver Larry Nadwodney, and the entire façade was repaired and restored, Lowder said. In addition to the support of Denison University, other partners in this initiative are The Ohio State University, Columbus State University, and Capital University. The RHM Board is currently seeking additional funding from corporate, foundational, or individual contributions. Contact Ann Lowder, Director, for more information on how you can help. Victoria Claflin Woodhull is one of the most inspirational and unsung heroes of American history. Saying that her list of “firsts” is impressive is an understatement: first woman to speak before Congress about woman’s right to vote, first woman stock broker on Wall Street, one of the first women to own a newspaper publishing company, and the first woman to run for President of the United States (1872). She was born in Homer, Ohio, Licking County. Victoria seemed to be a phoenix in her lifetime, rising from the humblest of roots and soaring to national fame and influence. She fell mightily in the 1870's only to rise again to wealth and prominence in England. Woodhull had been virtually written out of history and her story is more recently finally being told. Unfortunately, hers was a reputation that suffered due to her “radical” ideas that shook the very core of Victorian era mores. Her entrance back into the spotlight in recent times is tragically tinged with these earlier vilifications and untruths. "In her own character and person there is never anything but refinement in word or movement. She has a beautiful face, the idol of spirituality. Victoria Woodhull has done a work for woman that none of us could have done. She has faced and dared men to call her the names that make women shudder, while she chucked principle, like medicine down their throats. She has risked and realized the sort of ignominy that would have paralyzed any of us who have been longer called strong-minded. Leaping into the brambles that were too high for us to see over them, she broke a path into their close and thorny interstices, with a steadfast faith that glorious principle would triumph at last over conspicuous ignominy, although her life might be sacrificed. And when, with a meteor's dash, she sank into a dismal swamp, we could not lift her out of the mire or buoy her through the deadly waters. She will be as famous as she has been infamous, made so by benighted or cowardly men and women."